Ships from and sold by Syntricate. 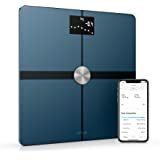 Measure and track 9 aspects of your body composition with our medical-grade body composition scale for a complete understanding of your overall weight.Using the bioimpedence method by using 4 conductors to determine the hindrance of electrical flow through the body. Weight (up to 180kg), Body Fat %, BMI, Body Water, Lean Mass, Visceral Fat Rating, Miscle Mass, Bone Mass and Daily Calorie Intake. 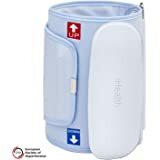 Up to 10 users. Tracks Weight, BMI, Muscle Mass, and More! 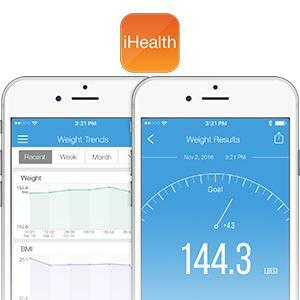 The iHealth Core tracks nine body vitals to help you achieve healthy, long term results. 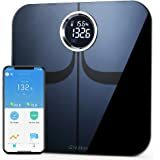 It measures your weight, body fat percentage, lean mass and BMI, body water, visceral fat rating, muscle mass, and bone mass. Installation only takes a few minutes. 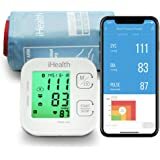 iHealth Core is connected via WiFi* and stores all your results in our HIPAA-compliant cloud. 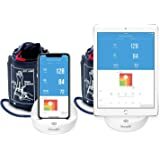 You can use the iHealth Myvitals App to connect to the cloud and access all your results. 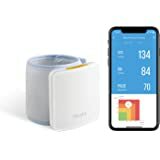 Without WiFi Connection, the iHealth Core can store up to 200 offline measurements. *Compatible with home routers using standard Wi-Fi 802.11 b/g/n (2.4Ghz), WEP, WPA and WPA2 personal security. 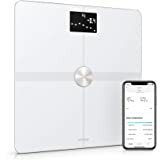 The Core automatically syncs your stats via your home WiFi network, so you never have to repeat the connection process every time you weigh yourself. Simple, easy-to-read charts and graphs show your progress over time. Equipped with four high precision sensors to guarantee the highest degree of accuracy. It can accurately measure weights from 11-400 lbs (or 5-180 kgs). The bottom left corner shows you the room temperature: it is recommended that you keep your surroundings at 21°C to feel well and avoid too much humidity, which can cause mold growth. 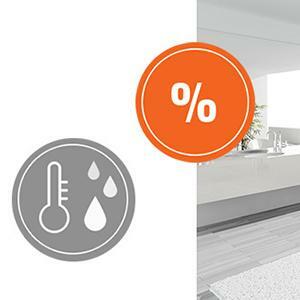 The bottom right corner shows the room’s humidity level: the ideal level should be between 40% and 60%. iHealth Core can sync with up to 10 users. 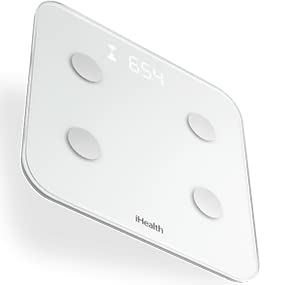 Simply step on the scale and iHealth will pull up your data from the others. It recognizes you based on your weight within a 5-pound variance. If two people are around the same weight, they just simply need to check to make sure their user number is displayed on the screen. If not, just click the bottom left of the scale like a mouse until you find your user number. - Apple iOS devices (requires iOS version 8.0 or higher). - Android devices (requires operating system 4.0 or later). 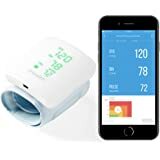 - See more from the Support page from the official website of iHealth Labs, Inc.
-Do not use the scale on uneven floors (e.g., carpet or soft surface), as doing so may result in inaccurate readings. 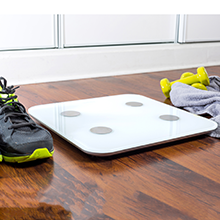 -Your feet should be dry and bare & be touching all four electric nodes on the scale. -Enter actual personal information before use for accurate body composition measurements. -Pregnant women need to consult their healthcare provider before use. Some physical conditions could affect hydration levels that may lead to inaccurate results. Please consult your healthcare provider for more information. -Not intended for use by professional athletes. 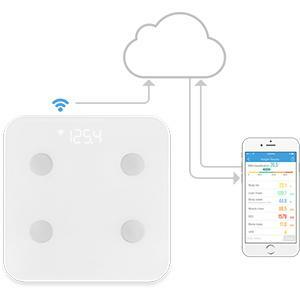 -Always store the iHealth Core in a dry place. 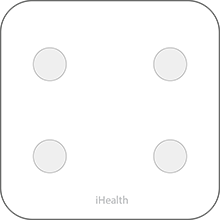 To ensure accurate results, keep the scale away from magnetic fields as these may adversely affect results or possibly damage the scale. 1. Download the MyVitals app from App Store or Google Play. 2. Insert the provided batteries into the scale. 'Set' appears on the scale screen. 3. Open the app > go in menu > click on 'Set up my devices' > click on 'select new devices' > select the HS6 Core scale. 4. Scan the QR code at the back of the scale. Follow the instructions in the app. - Body Weight: 11 lb-400 lb/5 kg-180 kg. - Body Fat: 5.0%-65.0% Temperature: 5°C - 40°C(41°F-104°F). - Humidity: 20 - 85%RH. - Units: kg/lbs (switch in app or switch by button). - Display: Backlit LED display. - Power: 4 x 1.5V AAA batteries included. - Battery life: Approx. 3 months with daily usage. 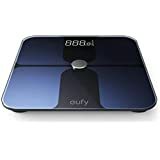 A little expensive when it comes to scales, but totally worth it when it comes to tracking/recording your weight, bmi etc. Setting it up was a little fidgety, but overall a good product. This product can keep records of multiple users. 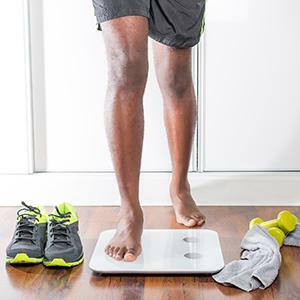 However it does so by using your last measured weight (withing 3kgs) to determine who is on the scale. While this is fine if your household are efferent weights, but I'm not sure how it would go for people with around the same. This doesn't affect me, but you may want to check into it if you do have similar weights. Overall it works as designed and appears to be well made and a bit heavier than I expected. The setup could be a bit easier if you have a secured network. 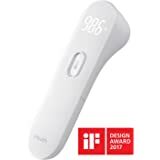 If you have any sort of MAC filtering on your wireless network you will have to disable it to connect this device to set it up since the MAC address of the device doesn't seem to appear anywhere on the physical device (though it will be the id once you've successfully connected it to the iHealth app). The most annoying "feature" of the WIFI setup is that it seems the device won't connect to a network on first setup that doesn't broadcast its SSID, even though it knows the SSID from the phone connection. When it doesn't connect, it doesn't provide any diagnostics, just a timeout error. I wonder if some other users' complaints about the WIFI connectivity might not be related to this issue. I also had issues getting the device back into setup mode, pressing and holding the set button didn't seem to be sufficient, instead I had to power cycle the device by removing and replacing a battery and then hold the button down. 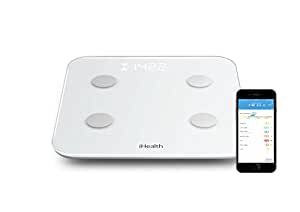 I worry a bit about the scales reliance on the iHealth app to setup and function as it might become a mechanism to make the scale unnecessarily unusable with some future app update. But other than that, it seems to be a quality product and to work well. 5.0 out of 5 starsI love this scale, probably the best purchase I have made this year. Definitely get one. Let me just say, I love this scale!! Right out of the box, this was super simple to setup. Just pull a plastic strip connecting the batteries, use your iPhone to scan the barcode and then enter your wifi password... Super simple. 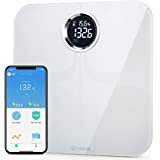 Once it is set up, it works just like any other ordinary bathroom scale; except this one sends the data to your iHealth account and shows up on your phone too! 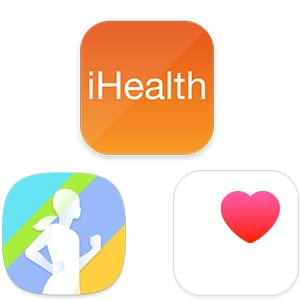 If you enable the Scale as a data source in your Apple Health app, all of the metrics will show up and you can begin to track your health. Pretty slick in my opinion. This is something that I can see being easy for older people, who may be less tech savvy, to use on a daily basis. 2.0 out of 5 starsDon't Purchase if Your WiFi Network PW Has Special Characters and is "Hidden"
Well, all looked good until I tried to connect it to my WiFi network. Below is what Tech sent me (they were very responsive). • SSID/Network Name: must be broadcast "Enabled"
Problem is that my network password uses a mix of special characters and not just "letters and numbers." Plus I have a hidden network so "no joy" on both counts and I'm sure as heck not going to change my security protocols for a weight scale. Sure wish this info was apparent on their web site regarding connection requirements (i'm sure it's there somewhere in fine print) and I sure wish that I had come across a product review comment that mentioned these two important facts (I'll fix that now). So now I must return this purchase and turn back to my old Withings scale which does seamlessly connect to my network. Only had it for 5 days, nothing but problems. I will give their customer service via email a good score, they are attentive and give you ideas to help... but the scale is inaccurate, you can step on it three times in a row and get three different weights. It is hard for more than one user. Sometimes it will recognize the second user, sometimes not. Sometimes it will connect with wi-fi, sometimes not. Sometimes it syncs with your phone, sometimes not. I have reset it numerous times in the last couple of days. Sorry to say, it is going back. Too bad, it looks nice, but too inconsistent. Look elsewhere. This was a "fail" on all counts. I was hoping to recommend it to my patients but that is not going to happen. Tried re-installing their app several times as well as the wifi connection and it never sync'd. Also the %body fat component never worked. There was a +/- 7 lb variance on my weight every time I stepped on it. Not to useful. There are better products out there for less cost. Mine is on its way back. I am awaiting their wireless BP to be delivered to test that out but I have now lowered my expectations.